SIGTRAN protocols are an extension of the SS7 protocol family, but carried over IP. 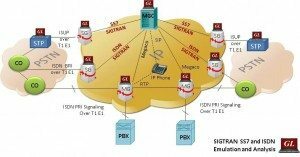 A signaling Gateway (SG) translates the SS7 TDM layers to SIGTRAN IP format. It supports the same application and call management functions as SS7 but uses two protocol layers on top of Internet Protocol (IP): Stream Control Transport Protocol (SCTP) and MTP3 User Adaptation Layer (M3UA). M3UA enables SS7 protocol’s User Parts (e.g. ISUP, SCCP and TUP) to run over IP instead of TDM lines. The enhanced SIGTRAN protocol test suite now includes enhanced feature rich MAPS™ frame work, which includes user-defined statistics, video traffic support, voice quality scores, and Command Line Interface (CLI) functionalities. Using CLI, all of GUI functionalities can be controlled by various TCL, Python, VBScript, Java, and .Net clients. In addition, the MAPS™ ISDN SIGTRAN now supports simulation of BRI network interfaces along with PRI interface. The supported standards in SIGTRAN protocol are SIGTRAN ITU, SIGTRAN ETSI, and SIGTRAN ANSI. 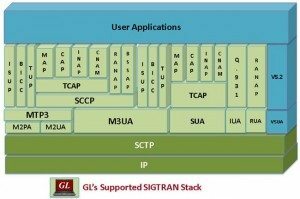 GL’s MAPS™ SIGTRAN is an advanced protocol simulator/tester for SS7 simulation over IP Networks. MAPS™ SIGTRAN connects to traditional SS7 interface and IP-enabled signaling nodes and then offloads TDM traffic to IP networks. Various traffic types include File, Digits, Tones, FAX, IVR, Dynamic VF, and Voice Quality Testing. MAPS™ can be configured to auto start the traffic over SS7 signaling or manually define traffic at run time. It can simulate ITU-T, UK, and ANSI variants of SS7 signaling stack implemented over M3UA, M2PA, M2UA, and ISUP protocols. It is able to run pre-defined test scenarios against ISUP test objects in a controlled & deterministic manner. The application supports testing network elements, error tracking, regression testing, load testing/call generation and generation of high volumes of ISUP traffic. MAPS™ SIGTRAN emulator and MAPS™ SS7 emulator can be combined into one entity to emulate a complete Signaling Gateway. 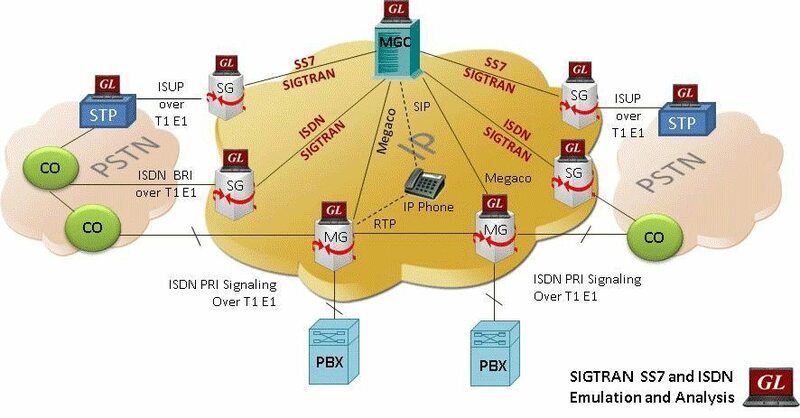 A Signaling Gateway (SG) translates the SS7 TDM layers to SIGTRAN IP format. It supports the same application and call management functions as SS7 but uses two protocol layers on top of IP, Stream Control Transport Protocol (SCTP) and M3UA (MTP3 User Adaptation Layer). 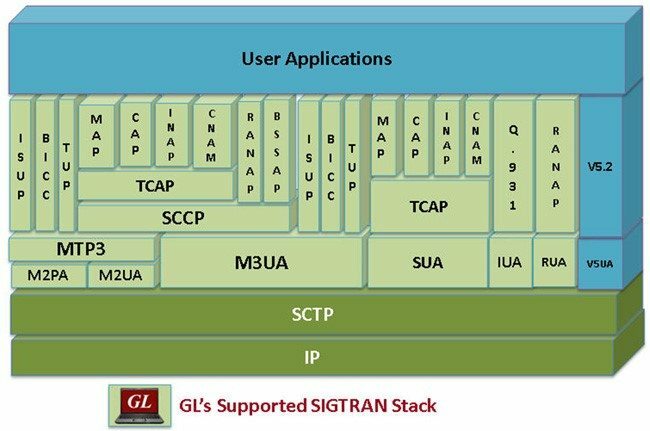 The supported standards in SIGTRAN protocol are SIGTRAN ITU, SIGTRAN ETSI, and SIGTRAN ANSI. Click Supported Protocols and Specifications to view the complete list. For more information, you can visit MAPS™ SIGTRAN emulator web page. ISDN is a very common protocol in the legacy network. There are two types – PRI (Primary Rate Interface or 23B +D) for T1 E1 lines and BRI (Basic Rate Interface, or 2B + D) for lower speed digital lines. ISDN BRI is referred to as 2B + D, as it includes 2 bearer ‘B’ channels each with 64 kbit/s rate and one 16 kbit/s signaling channel (‘D’ channel or data channel). ISDN PRI includes 23 ‘B’ channels over T1 (or 30 ‘B’ channels in E1), each of 64 kbit/s, along with ‘D’ channel of 64 kbit/s. GL’s MAPS™ ISDN SIGTRAN is an advanced protocol simulator/tester that can simulate a complete ISDN connection from TDM to Signaling Gateway (SG) and Media Gateways Controller (MGC) supporting both PRI ISDN (with traffic) and BRI ISDN interfaces. MAPS™ ISDN SIGTRAN connects to traditional ISDN interfaces and IP-enabled signaling nodes and then offloads TDM traffic to IP networks. Various traffic types include File, Digits, Tones, FAX, IVR, Dynamic VF, and Voice Quality Testing. MAPS™ can be configured to auto start the traffic over SS7 signaling or manually define traffic at run time. ISDN signaling is defined as per the ITU-T Q.921 / Q.931 standards. It is a powerful tool that can be used to perform detailed testing of ISDN protocol messages over IP, and offers a complete solution for testing, troubleshooting, and maintenance of devices and networks. MAPS™ ISDN SIGTRAN emulator and MAPS™ ISDN emulator can be combined into one entity to emulate a complete Signaling Gateway. A Signaling Gateway (SG) on the TDM side connects to standard PRI T1 E1 lines (or BRI) and translates the ISDN messages to SIGTRAN IP format. It supports the same application and call management functions as ISDN but uses two protocol layers on top of IP, Stream Control Transport Protocol (SCTP) and ISDN Q.921-User Adaptation Layer (IUA). The SG talks to a Media Gateway Controller, which in turn performs further routing and signaling decisions within the NGN. Supports both interfacing with high-speed PRI (Primary Rate Interface or 23B +D) and low-speed BRI (Basic Rate Interface, or 2B + D) digital lines. SIGTRAN protocol decoder software is a VoIP testing tool that permits real-time analysis, call trace, capture, and filtering of SS7 and ISDN signaling messages over IP. The analyzer supports SCTP, M2UA, M3UA, M2PA, SUA, IUA, BICC, INAP, CAMEL, ICMP, MAP, TUP, TCAP, SCCP and more. The analyzer is an optional application with GL’s PacketScan™ – All IP Analyzer. The SIGTRAN analyzer can be used with SS7 analyzer simultaneously to perform testing and verification of Signaling Gateways.